You’ve got all your content written out and ready to hand off to your audience. But, you’re feeling a little reluctant about putting it out on the World Wide Web. Let’s be real—it’s because no one wants to run the risk of turning his or her sales letter into one of those insane hodgepodge pages that a brand has the nerve to publish. You know, the ones with the big flashy red buttons that look spammy and copy that reads as if you’re being screamed at. You want to avoid that gag-worthy mess. Maybe don’t go that far. The point being is that you can translate all your content into a messy, unattractive online page, but you’ll scare off your audience and they’ll quickly hit the X button on their browser. Sound the alarms—that’s definitely a situation to steer clear from. So, I’m sure you’re probably here because you want to know what you can do to your written sales letter to beautify it for your reader. Well, I’ve got you, friend. Today, I’m going back to basics, giving you three key ways to help translate your invaluable content into a profitable (and pretty) page that sells. That’s one thing you can check off your list. But, are you also feeling completely swamped by the amount of time it takes to actually write your content? Maybe hours, days, even weeks?! I bet you have plenty of other things piling up on your to-do list, but this task seems like it’s starting to take over your life. Boy, do I have something good in store for you—a tool to save you an astronomical amount of time (and even some cash). I have to say, once you start using it, you may not know what to do with all your free time. Keep your eyes open below—you don’t want to miss it! This may sound silly as it’s less words of wisdom towards design, and more towards fundamentals. It’s critical, however, and makes it easier for you to successfully create a stunning sales page. I’m sure you’re familiar with the saying, “You can put lipstick on a pig, but it’s still a pig.” Well, it applies here. You can’t execute good design if you don’t have good copy to go with it. And I’m not talking about the elaborate stuff we’ve shared in previous posts to help you write copy that sells. I’m talking about the elementary stuff here. First of all, no more exclamation points closing out every other sentence. Your audience doesn’t want to feel like they’re being yelled at. And, definitely no more hype and puffed up BS sales terms. Selling like hotcakes! OR THE best in the business! What does that even mean? For starters, it should be filled with nothing but clarity and value while communicating all there is to know about the offer. Ultimately, go au-natural and write conversationally to help convert your visitors into paying customers. 2. Readability gets to ride shotgun. Your copy is in the driver’s seat, but the readability of your page should call “shotty” every time. What’s readability, you ask? It’s the level of ease to read and actually understand written text. Sometimes sales letters can be a beast to digest. But, only if you don’t format the content in the correct way. Take this real-life chaotic page as an example. Gross. Trying to read that feels a bit like pulling teeth. Do you want to suffocate your audience and leave them gasping for air as they’re scrolling through your page? Didn’t think so. Short, attention-grabbing headlines—aim to keep them fewer than 70 characters. Sub-headlines—include every 2-3 paragraphs, making it easy for the reader to scan your page and stop at what appeals to them. Abbreviated sentences—improve the rhythm of your copy with short sentence structure. Don’t hesitate starting a sentence off with “And,” “But,” or “Because.” Your English teacher back in the day might not like that, but be brave with your sales copy. Clear, ramble-free paragraphs—hit enter every 3-4 sentences. After all, there’s no such thing as too much white space. Bulleted or numbered lists—organize and present your data in a neat way. Dress up your text—bold, italicize, or underline specific keywords for added emphasis. Because you know the exact message you’re trying to get across to your audience, it might be a bit difficult for you to notice low readability. 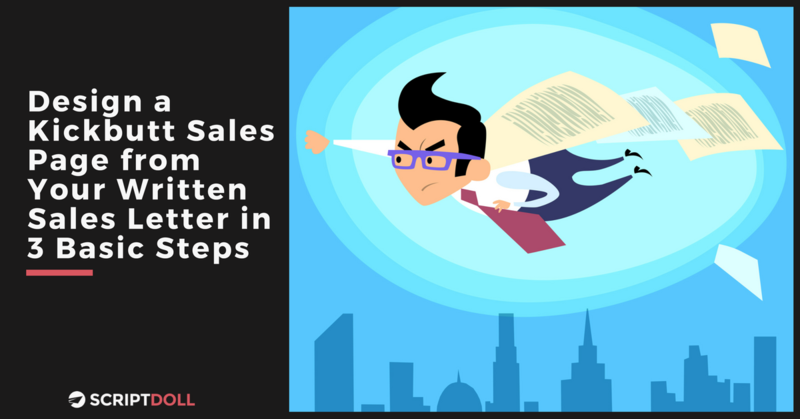 Implement these tips, however, and you’ll be one step closer towards crafting a pretty sales page that gets your readers to stick around. 3. Accessorize with good-looking visuals. Images, bite-sized infographics, graphs, and tables can, and should, be thrown into the mix to strengthen your content. Consider them the accessories to your outfit—a simple t-shirt and jeans can look a bit boring. But top it off with a bold statement necklace, slick watch, and/or bright shoes and you’re dressed to kill. Today, we’re on a roll with the scroll. So, good-looking visuals will do nothing less than captivate your audience. They give them breathing room, breaking up the monotony of your text-heavy page. In fact, visual content generates 94% more views. Just remember—and this is an important one—whatever graphics you choose to add should be of value to the reader. Avoid loading your page with stiff stock photography of people at their desk or cheesing real hard. And, no, I’m not saying stock photography is the enemy here. The problem is, it runs the risk of being irrelevant to your reader. Consider throwing in photos of yourself, the business owner, and other employees if applicable. Or, at the very least, more candid stock photography that looks less staged. Compare these two images, for example. Which do you prefer? The one on the right, probably. Also, stop dropping in the first graphic from Google search that relates to your text in any way. Typically, these are very overused. Luckily, there are plenty of resources out there to help you create standout visuals to break free from the mold (we have a blog post coming up that will speak to this; be on the lookout!). Feeling swamped by the amount of time it takes to actually write your content? I hear you loud and clear. I’ve felt that way before, too. It seems like writing for your business can take a serious chunk out of your day or week. And, maybe you find you’re not getting the conversions you had hoped for once you finally put your words out there for your audience to read. All that hard work turns into a pile of mush. That all stops today. I’m about to share a solution I’ve found that helps me write enough sales material to keep up with the demands of the business. Not to mention, assists me in crushing my conversion goals. It’s called ScriptDoll—a one-of-a-kind piece of software that creates high-quality sales messages at the push of a button. No longer will you be forced to start completely from scratch each time you’re in need of some content. Frees up your time to put focus towards more productive tasks—simply complete your product portfolio, answer a handful of painless questions and ScriptDoll turns your answers into engaging copy in a matter of minutes. You’ll finally have more time to scale your business! Keeps your content fresh with an ever-growing, extensive library of templates—new templates are added on a monthly basis, from sales letters to email sequences, video sales scripts, native ads, and much more. As a result, you’ll avoid putting your audience into a zombie state-of-mind, steering clear of sharing the same thing over and over again. Saves you some serious moola by keeping your copywriting in-house—there’s no need to drop loads of money on outsourcing your writing tasks to copywriters. Also, you can avoid investing hours of your time trying to improve your skills in a copywriting course. That’s because ScriptDoll crafts its effective templates thanks to its connections with champion copywriters around the world! Decreases your workload to almost nothing with pre-made product profiles—are you a puppy trainer, dentist, plastic surgeon or graphic designer? If so, you’re in luck because your product profile has already been completed for you. Many more are waiting to be used within the software engine, making it that much easier to push out content that converts. Well, as I mentioned earlier, you can pass on this tool and invest a ton of your hard-earned money to outsource content to a copywriter. Or, you can give up countless hours of your time to try improving your sales writing skills through a copywriting course. Maybe you also give one of those content creation tools a go, which typically only ends up delivering copy that makes you sound like a robot. Or, you can just keep doing what you’ve been doing—trying to tackle it all on your own. But, now you know all about what ScriptDoll can do for you, solving your biggest headaches that are keeping you up at night. Can you envision the load of stress evaporating from that invisible backpack you carry every day? Because, it’s already filled with the weight that goes into owning your own business. Therefore, more time on your hands as the hard copy work is taken off your desk and completed for you? Most of all, the conversion numbers that’ll be rolling in as a result of producing stronger copy? That all sounds like a huge relief. So, what’s keeping you from making this your reality? Wave Goodbye to Hours of Writing—Get Your Personalized Copy That Sells Today! Finally, you’ve got the tips you need to help design a kickbutt sales page. And, above all, you now know of a trustworthy solution to start using today that’ll produce persuasive sales copy and slash your writing time by 75%, if not more. Entrepreneurs like you are raving about ScriptDoll, and they’re waiting for you to join them in getting the results you’ve been hungry for! So, grab this tool today, risk free. Have questions or something to share? Let us know in the comments section below. We’d love to hear from you.